A professional sample engine for drums. Toontrack Superior Drummer 2.0 "The New York Studio Legacy Series" is a complete overhaul of the original dfh Superior engine. The Toontrack team made painstakingly sure not to lose any of the sound quality, attention to detail, and musicality of their popular drum sampler. Superior Drummer 2.0 has been redeveloped for optimized use with e-drums with more effective use of sample layers and much improved loading times. It includes custom MIDI played by Nir Z accessed through its new customized MIDI engine and arranger, EZplayer Pro, and has standalone capacity through Toontrack solo. Premium UK-based software developer Sonalksis has outfitted the Superior 2.0 with a 5-band EQ, high and low pass filter, compressor, gate, and transient designer filters. The interface is reminiscent of EZdrummer with its simple handling and layout but gives the user layer upon layer of in-depth features to create the ultimate drum track. 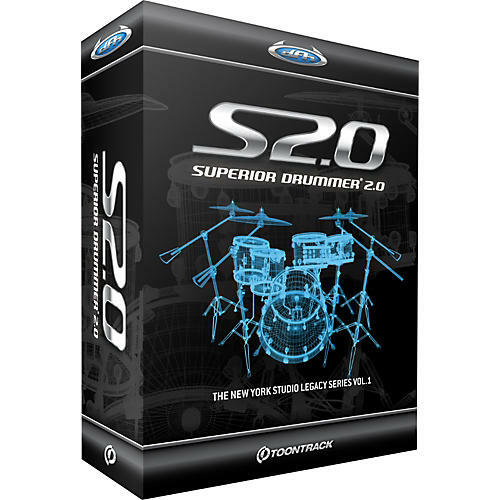 Superior Drummer 2.0's samples were recorded by Pat Thrall, Neil Dorfsman, and Nir Z at Hit Factory, Avatar Studios, and Allaire studios, NY. The three have worked with artists as diverse as Meatloaf, Celine Dion, Nick Lachey, Sting, Bruce Springsteen, Dire Straits, Beyonc, Bj¶rk, Kiss, Joss Stone, Genesis, John Mayer, and Chris Cornell.